In college, she studied painting. She had wanted to be a writer. Her father was a writer. But in college, she transitioned from drawing fictions on a page to painting pictures onto canvases. She was committed to painting when she took a 3D course. She labored over soapstone sculptures, carving away at the surface. “You’re more of an additive than a subtractive,” her professor said. She is Kate Gilbert, who, after twenty years in Boston, has ricocheted through every facet of the art community here. Currently a curator and director of Now and There, the public art non-profit who brought JR’s Inside Out Project to Boston last fall, Gilbert is an artist whose studio practice includes video, installation, performance, sculpture, and persistently, painting. Her practice and curatorial work are united in Gilbert’s enduring appreciation and fascination with art’s power when placed in public. More Additive than Subtractive: Kate Gilbert by Leah Triplett Harrington was published April 26, 2016 for Big Red & Shiny online magazine. 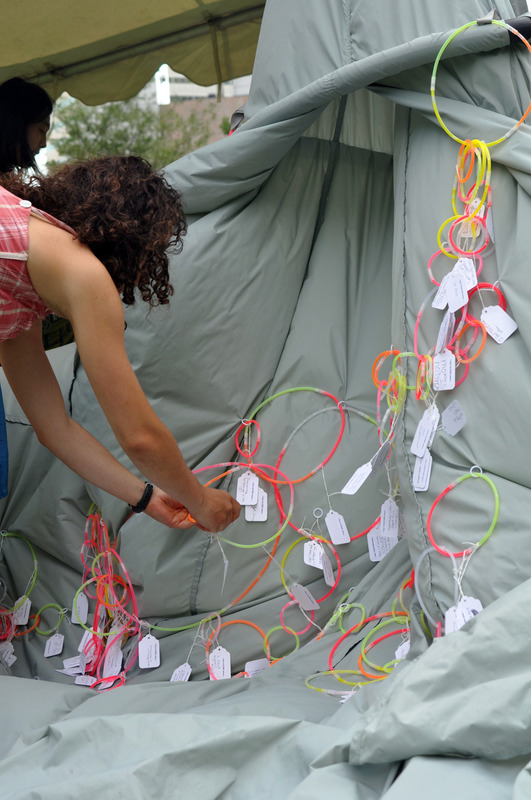 Thanks to all who came out to Figment Boston 2014 and shared your thoughts about being simultaneously alone and together. Here my favorite photos from the day. Others can be found on the project gallery. 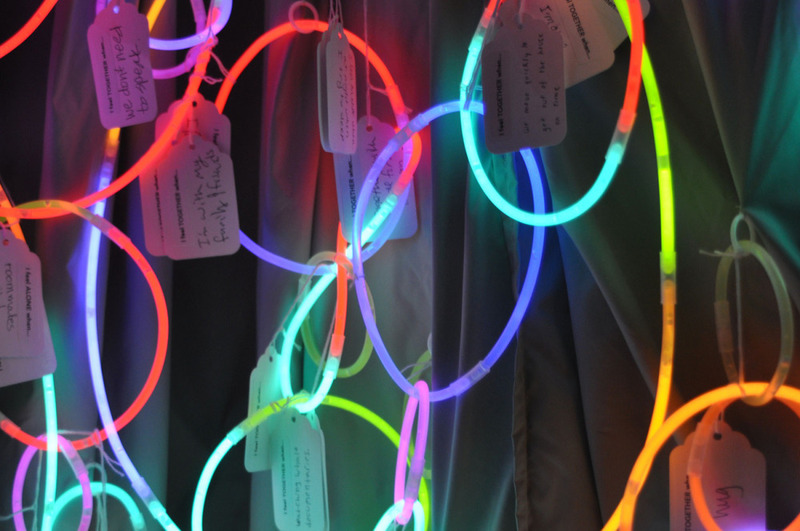 Frigid Phrases was submitted to the Greenway Conservancy’s Winter Lights call for proposals. Though it was rejected as light-based art, we were asked to develop it as an event “to bring warmth and cheer to the Greenway during the darkest part of the year”. photo: (c) Connie SawyerFrigid Phrases turned out to be aptly named. Despite a wind chill temp in the twenties, approximately 125 people played with us and received free gloves. Participants included international tourists, businessmen, Greenway neighbors, parents and children on school break, artists and faculty from SMFA Boston, the contributing poets, and our hardy friends. Many were initially unwitting participants, such as the pair of businessmen on their way home, or the family walking by after visiting the New England Aquarium. It gave me great delight when these passersby accepted my invitation to play and later proudly held their gloves saying SOUL CAKE or DENSE MIND. There’s something magical about the combination of spontaneous play and free stuff when you’re not expecting it. People like rules when playing a game; too structured and its not fun; without boundaries, we feel uncomfortable. 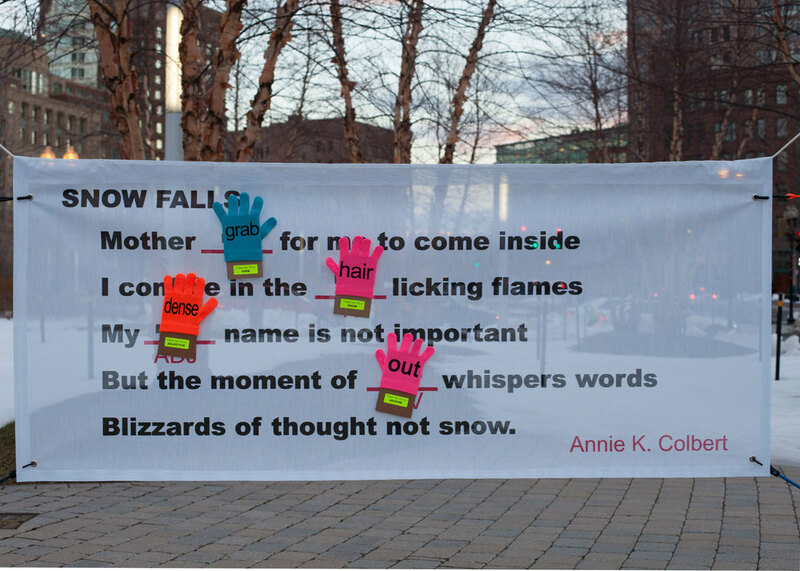 Participation is increased if one can directly affect the outcome of the work; poems were submitted by area-poets and they kept changing each time a participant swapped out a word glove. My intent for any work I create, be it event or sculpture, is that it have a life after its first display. Frigid has that potential, whether as a personal memory that one recalls looking down at your gloves, or the collective history that we created on Twitter and continue to create when we're asked, "Why do your gloves say WEARS COLD?" If you’re interested in continuing the event’s life and hosting Frigid Phrases between now and April, please contact me. We have about 100 pairs of gloves left. We’re also interested in reinterpreting Frigid for warmer climates and seasons. See FRIGID PHRASES gallery page for more images, the blog for more information on how the game was played. And Tweet us @frigidphrases when you see a pair!